Sui Generis Recordings : The best of the best. As an enthusiast of classical music, I frequently get asked to recommend recordings. I can understand the confusion: for well known pieces of classical music, there are frequently 20 to 50 recordings available. For less well known pieces and composers, the question is ``Will I like this?'' often stated as ``Is this any good?'' And with Amazon and iTunes open 24 hours a day, the glut of choice is available all the time. Fortunately, most classical musicians whose recordings are available are good players, and most of the performances are quite sufficient if you are learning about classical music. Nonetheless, both the recordings and the performances show a lot of variety. The music is not obscure, meaning that there are at least a handful of performances to choose from. They are usually pieces you might hear on the local classical FM station, or in just about any season at a concert hall. In other words, they are not rare. The recordings are modern, stereo recordings that are going to be satisfying on an iPod, in the car, or on a good hifi system. The concept of what it means for a recording to be modern goes back to the late-1950s for a few labels [Mercury Living Presence, RCA Red Seal, etc. ], but for the most part it is safe to think of the modern era to have started around 1970. The recordings are available; there is no point in recommending something that cannot be purchased. The performances are distinctive, and show real insight into the music. Even your snobbiest friends who are fans of either or both classical music and hifi will approve, and maybe be impressed. NOTE: Cover art varies with issue date, and even the country where you live. Some of these recordings have been issued many times over the years, and in a variety of formats. Most of the art came from the issuing label's website, so I am leaping to the conclusion that the pictures shown below represent the current (May 2012) cover art. I put this recording at the top for several reasons. The obvious one is that ``symphonies'' are what most people are thinking of when they hear the words ``classical music.'' This boxed set is a tremendous deal --- I bought mine for $50 at Amazon, which comes to $3.57 per disc, and I bought it because many of these recordings had been being sold separately for $15 each. Finally, we might as well start with some controversy. 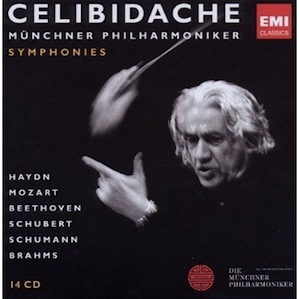 Celibidache (approx. pronunciation: CHEL-ee-bee-DAHK-ay) was one of the most controversial conductors of the 20th century. He only recorded live, and he did not particularly care for recording. Most of his tempi are on the slower side of the usual speeds at which music is played, and he is on record as having said that there is a right tempo only in the context of the interaction between the music, its performers, and the audience. The best pieces are the Brahms 3rd and 4th, the Beethoven 4th and 8th, and all of the Schuman recordings. The performances are all quite satisfactory, and as a listener you will get a high quality collection for little money. Short by modern standards, these six symphonies from the late 1780s have been recorded by everyone, or so it seems. Although Bernstein is often known for having a heavy and plodding hand, in this case he and the NYPO tackle the material with directness and drive. The recordings are fresh, and could have been made last week by the latest DSD technology. 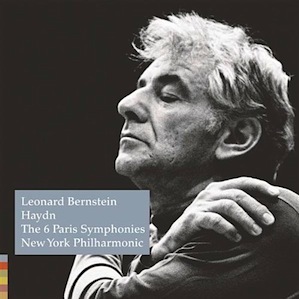 The Paris symphonies are available along with Bernstein's other NYPO recordings of Haydn in a twelve disc set for about $USD50. While they are all good performances, the Paris symphonies are like none other. 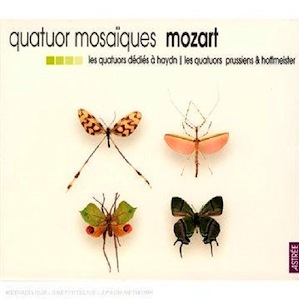 My friend Tom introduced me to the Quatuor Mosaïques about five years ago. I suppose they are the classical music equivalent of an unknown Indie band, but they probably would not see themselves that way. Known for the truly classical period music, these specialists are in a league of their own when it comes to performance, nuance, and an approach with a difference. The Mozart quartets were out of print for a while, and almost reaching insane prices on the used market, but they are now back in the catalog. Five discs. About $USD40 for the set. At long last, a new recording of this warhorse has displaced my favorite of many years, the Carlos Kleiber recording with the VPO from the early 1970s. 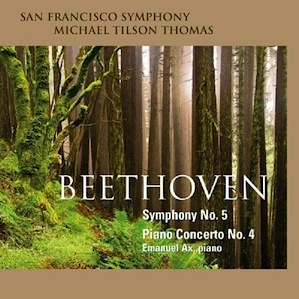 With the usual excellent sound of the San Francisco Symphony series of Mahler recordings, Tilson Thomas has turned his attention to these two well known pieces. Expectations were high; and he and his band delivered. Although I have not read this elsewhere, Ax starts off the Piano Concerto playing something that is not written: an arpeggio rather than the chord. Both pieces are this distinctive all the way through. And how could we overlook the fact that they are live performances. My friend David Janszen describes them as ``impossibly good'' and we both wonder what it would be like to be at a concert by the SFSO. As well as the usual sources, because the SFSO is its own label, you can order directly from the SFSO..
And now we come to Mahler. Mahler has fared well in the CD and SACD era of digital recording, so why the 10th and why this performance of it? 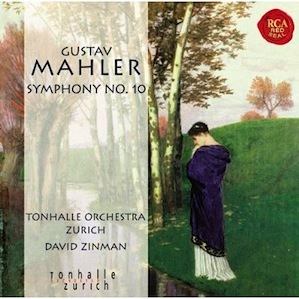 The Tenth was Mahler's final symphony, and entire books have been written about its history. Several noted people have, in various ways, tried to finish it. Most of the debates about doing so have centered on how to finish it in the style of Mahler, leading to the awkward phrase ``performing version'' used to describe efforts to leave as much in place as practical. Clinton Carpenter decided to finish it, creating a work that is a bit of him and a bit of Mahler. Carpenter, a Chicagoan who died in 2005, made no claims for authenticity, and we finally have a great recording of a fantastic piece of music that does not sound like it is missing a few pages of music and half the orchestra. This recording is a hybrid SACD that only costs about $15, depending on where you buy it. Given a great hifi or a good pair of headphones, listening is a wonderfully absorbing experience. Note: A full history of the completions, as well as a different opinion about the merits of the Carpenter version can be found in this article. This album has gotten a lot of buzz since it came out. 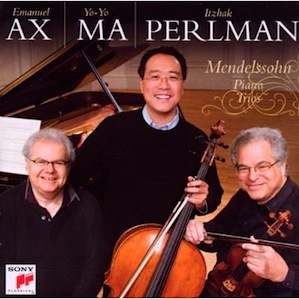 Mendelssohn (his remains, actually) turned 200 years old recently, and these two trios received still more recordings. There were probably too many recordings already, but at least one came out of the 200th anniversary celebration that was head and shoulders above the others. It took three old men to do it. We don't really think of Yo-Yo Ma as being old, but he is the youngest of the group and he older than I am. The performances scream the power of youth, and Mendelssohn was young when he wrote these two mainstays. How about some music from the new world, as opposed to Dvorak's New World Symphony? 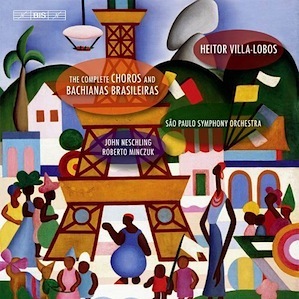 Villa-Lobos was a Brazilian composer who died in 1959, and he wrote a big stack of assorted forms of serious music most of which is excellent. The amount of Brazilian flavor to the music depends on when it was written, and the Choros were written in the 1920s during his nationalistic period. When played by a Brazilian orchestra, this is about a Brazilian as you can get without a passport. A choro does not call for a particular combination of instruments like an orchestra, or a string quartet. There is a lot of variety here, with the 14 pieces requiring odds and ends. The first is for solo guitar, #11 is a piano concerto of a sort, #5 is for solo piano. 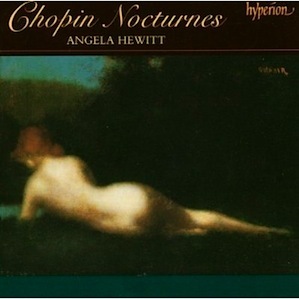 Some of the Nocturnes of Chopin are quite popular. Among classical music's fans, they are all reasonably well known, and you should have a complete set. The recent set by Angela Hewitt is one of the best, and it can be downloaded directly from Hyperion Records, as can most of their catalog. Want to talk about the review?